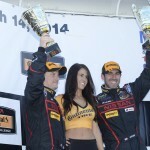 SALINAS, California – April 27, 2015 – Doran Racing has high hopes for Saturday’s Continental Tire SportsCar Challenge race at Mazda Raceway Laguna Seca because its Nissan 370Zs are well suited to the 2.238-mile, 11-turn road course near Monterey, Calif. The team has done very well there in the past with it cars, which advertise Nissan’s popular GT Academy program where gamers are groomed to race professionally. 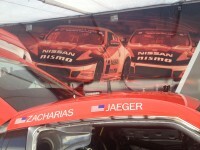 Last year the Lebanon, Ohio-based team finished fifth and sixth with its pair of Nissan 370Zs at Laguna. The year before that the team’s Brad Jaeger and B.J. Zacharias finished third after 75 laps of competition. They return with the #14 this weekend, and they hope there will be no substitute for experience. They both have many years of experience at Laguna Seca in a wide variety of cars, and their compatibility, teamwork and work ethic makes them a potent combination. Nissan GT Academy champions Nick McMillen and Steven Doherty will be paired together for the first time to drive the #41. David Empringham and John Farano drove that car last year, and McMillen and Bryan Heitkotter drove it in the first two races of the year. Doherty, who was born in nearby San Jose, is stepping in for Heitkotter, who is now racing a Nissan GT-R GT3 in the Pirelli World Challenge’s GTA class. Doherty competed in seven CTSCC races last year in the Street Tuner class, including the one at Laguna, but this weekend’s event will mark his debut in the faster Grand Sport division. It will be McMillen’s first actual race at Laguna. He met his new co-driver at a GT Academy competition several years ago, and both hope that what they’ve learned as gamers will translate to success in actual on-track competition. All four drivers are hoping for long green-flag runs in Saturday’s 2.5-hour race. The Nissan 370Z’s light weight and nimbleness over the twisty course should help the wear of its Continental tires, which could translate to increased track position over long stints. Of course staying out of accidents, not encountering any mechanical difficulties, and not making any mistakes on the track or in the pits will be paramount too in the very competitive series. Saturday’s race will feature 18 GS cars and 28 ST cars for a field of 46. The GS action begins with two practice sessions on Friday prior to qualifying at 6:05 p.m. local time. Saturday’s race is slated to begin at 1 p.m. local time, or 4 p.m. Eastern. Live coverage will be available on IMSA.com. The race will be televised on Fox Sports 1 at 9 a.m. Eastern on May 17. Additional information is available on DoranRacing.com and the team’s Facebook page. Brad Jaeger, Charlottesville, Va.: “I’m hoping for another strong finish at Laguna Seca this year. The Nissan 370Z has always performed really well at Laguna Seca. Like every race, we’re just going to have to stay clean and make sure the car is there for the last 30 minutes. Everyone at Doran Racing has been working hard prepping the cars for this coming weekend. The series has adjusted the Balance of Performance on a few of the cars, and I think we’ll see a pretty competitive race up front. “The Nissan 370Z is really light compared to our competitors, so we definitely have an advantage around Laguna Seca over the course of an entire stint. The Z also really shines under braking into Turn 1. “The first time I visited Laguna Seca was as a kid during the Monterey Historic Races. I remember hiking all around the track and hoping that one day I could race there. I’ve been very fortunate to have raced this amazing track in so many different kinds of cars. I’ve driven a F2000, Pro Star Mazda, Daytona Prototype and the Nissan 370Z there, but I still haven’t won at Laguna Seca. Hopefully B.J. and I can make that happen this year! B.J. Zacharias, Cincinnati, Ohio: “I’m really looking forward to our return to the West Coast. There are a lot of diehard Nissan fans in California. “We have had good success at Laguna Seca, where last year the Zs finished fourth-fifth-sixth in the GS field. “We have improved upon the car we raced there in 2014, and we’re looking for results. Brad and I need a solid run to climb back in the hunt. “We had a great pace at Sebring, but we needed a yellow to stack up the field and it didn’t happen. I feel this team is very close right now to getting solid podium results. “The field in GS is a little smaller this year but the competition seems even more fierce, especially between the top eight to 10 cars. “Kevin and the guys back at the shop were able to spend time improving the 14 and 41 versus repairing them, which is helping push this program forward. It’s going to pay off sooner rather than later. Brad and I just need to drive smart and do our jobs. Nick McMillen, Salem, Ore.: “Last year both cars finished great at Laguna. If past results give us an insight to where we are now, I believe we’re more than capable of landing on the podium with one or even both cars. I think both cars have a strong driver line-up, so it will come down to consistency and staying out of trouble. That, coupled with our Nissan 370Z, one of the lightest cars in the class, is a great combo for the tight and twisty Laguna Seca. “The Nissan will be strong at Laguna due to its light weight and maneuverability in some of the tighter sections, like Turn 1 and the Corkscrew. Due to the weight of the car we are able to run quicker stints overall due to the longevity of our tire wear compared to some of the other cars. “I haven’t raced at Laguna, but I attended the Continental Tire SportsCar Challenge race there last year, where I watched Steve and Bryan Heitkotter participate as teammates in the Nissan Altima. Steve and I actually met a few years back at the 2012 GT Academy Finals in San Diego. He went on to win that year, and I won the following year. It has been a great journey to now being racing together after competing against each other for the top spot of GT Academy in 2012. I’m really looking forward to Laguna Seca, as this will be the first time we have co-driven together. If the past has taught me anything, any combo of the GT Academy alumni make a competitive driver pairing. “I don’t have any particular ties to Laguna Seca other than it’s the closest race to home for me in the series. I’m hoping we will have some extra time to see the Monterey area. I enjoyed driving around and wandering through Cannery Row last year when I attended the race. I hear the 17-Mile Drive is quite good as well. “I cannot even begin to count how many hours I’ve played at Laguna Seca in simulators, so I probably won’t spend as much time in preparation since I already know the track very well. I may spend an hour or two just to get the rhythm again, but I think once I arrive at the track it will come down to patience and finesse in order to be quick there. “I love entering the GT Academy competitions each year just for the sake of competing and giving my friends tips to be quicker, or just to hassle them a little if they can’t beat me. The first round of this year’s GT Academy actually just began a few weeks ago, so I had to fire up Gran Turismo and put in a few laps. At the moment I believe I stand in the top 30 or 40 in the world, so it looks like I’ve still got the touch! Steven Doherty, Plainfield, Ill.: “This will be my first race in the GS class, so I can only say what I’ve seen from the seat in the ST class Altima, but Laguna seems to be a track that lends itself to a good, balanced chassis. The 370Z is the lightest and most nimble GS car. I think some long green-flag runs would help us out so we can watch the heavier guys hurt their tires! Our driver lineups are strong and I think it will be a good race for us. Being the lightest GS car, I feel the tire wear will be our biggest advantage. I really don’t have any experience though, so it’s hard to say. “I met Nick at a GT Academy event a few years ago. We also talked for a bit at Daytona this January when I came down to cheer the guys on. We chat often over text and social media. I’m looking forward to driving with him, as he has showed a lot of potential in the Blancpain series and in his races here in the United States so far. “I do sort of have a tie to the area, as I was actually born in San Jose. I only lived there for a couple of weeks as an infant, but I guess that kind of makes it a second home! I hope to stay for a week after the race to do some mountain biking with GT Academy alumni Jett. Anything else we can do with the team while we are there is always a bonus! “Laguna Seca has always been in the Grand Turismo franchise. I can’t even add up the hours that I’ve spent doing virtual laps there. The biggest adjustment for me last year was the slippery nature of the track and the banking in the corners, because it’s a little more than it appears virtually. Last year my pace was very good right away, which for sure translates from all my virtual laps. “This year’s Academy just started. It always creates a good buzz in the community, so I do enjoy turning a couple laps with the guys to compare times. I for sure will not put in the actual hours it takes to win it again though.